Hi, I am interested in your 1963 Morris Minor (stock #4447-CHA) listed on Autotrader for $9,995. I'd like to get more information about this vehicle and confirm its availability. Heres the most affordable TV star tribute youll likely ever meet. This 1963 Morris Minor is a great way to grab attention on the streets, and when you park it, youll love telling people how a similar one was used in popular UK television shows like Heartbeat. The light blue and white Panda Car is a police icon in the UK. While they arent quite as powerful as our Crown Vics, they are just as much a timeless symbol of authority on that side of the Atlantic. So while the classic design of the Morris Minor helped put England on wheels, this one represents what happened if those wheels violated the law. 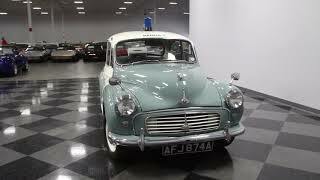 This is a proper Minor with the correct wheel covers, badging, and trim. Plus, it really looks the part of authority correctly with its gumball light on top, crisp Police badging, and cheeky PANDA 1 marking on the roof. This one needs to look authentic, because one similar to it was used during the long-running UK television show Heartbeat as well as part of the comedy special The Hunt for Tony Blair. Inside, the light blue continues on the seats, carpeting, and dash. As a true British machine, this is a right-hand drive vehicle, and the classic Morris steering wheel with M badge in the middle is positively charming. And because you want to make sure the bad guys are intimidated by a car with Minor in the name, you have controls for the light, siren, and police light box in the rear. But even without all the patrol car fun, this is a nice classic to drive. The vintage center gauge cluster looks great, the gear stick is in the perfect position, and theres even an upgraded AM/FM/CD stereo when youre tired of hearing the police siren. If you know British cars, then youll love seeing all that green when you open the hood. Thats the unmistakable sign of an A-series motor. The engine is a well-known and widely used power plant that found a home in plenty of British vehicles. Its the backbone of English motoring, which makes it quite robust and theres easy parts availability. This is a fantastically original-style presentation, which tells you this has been cared for correctly. So youll feel confident taking it on the road. With the control of the four-speed manual transmission, we know you find the motor experience quite lively. Complete with photos of this cars star power, this was already a cool and affordable classic even before you knew about its TV history inspiration. You know something this unique and obtainable wont stay available for long, so dont miss out. Call now!